John Seevers makes stylized, adorned long leaf pine needle baskets. He has gathered the Long Leaf Pine needles in Florida and finishes the pieces in shellac to preserve the shape. He incorporates semi precious stones and other objects in the baskets. “Every coiled basket wants to be symmetrical. I take it as a personal challenge to assure that it is not.” This maverick attitude represents John’s approach to basket making. He wants the basket to flow with movement. He wants it to take advantage of light and the ambiance of the room in which it is set. Primarily, he wants the basket to be interesting. John starts with a tightly bunched set of pine needles called a coil and creates the basket by attaching this coil to the rest of the basket. The shape and openings (windows) are created by manipulating this coil. He selects stones and other objects by their color, light refracting qualities, and “attachability”. In many baskets, John includes a Tenerife Weaving. These creations add a new texture and create another source for backlighting. The process is a traditional art of the Tenerife Islands. 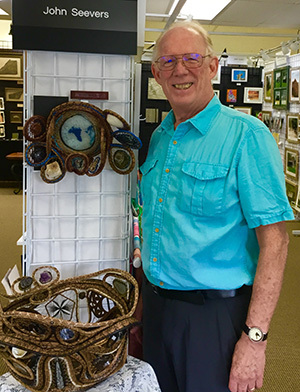 John and his wife, Ginny collected Native American baskets after seeing artists creating them at the Sacred Circles Exhibit at the Nelson-Atkins Art Gallery in Kansas City. After retiring to Florida he learned to make traditional Seminole pine needle baskets, but soon started innovating with color and stones. He sold baskets on the Internet all over the world, with Courtney Love as his most celebrated buyer. She reportedly gave baskets to Gwyneth Paltrow, Woody Harrelson and Scarlett Johansson. He has won awards at shows and sold in Galleries in Tampa, St. Petersburg, Estero, Kansas City, LaConner and Bellingham. He has lived in Kansas, MIssouri, Florida, St. Croix USVI, and Washington.